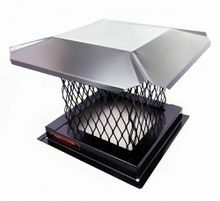 Constructed of 18 ga 304 Stainless Steel with a 3/4” expanded stainless steel mesh. These caps mount to the outside of the flue tile providing greater free air space for better draft. Legs kit (not included) attach cap to the inside of the flue if your flue tile doesn’t extend above the crown. 100% galvanized steel resist rust and corrosion. Black powder coated finish. Fast and easy installation. Measure OUTSIDE of Flue Tile. Use chart to order proper size. Each size chimney cap has 2.25 inches of adjustment. Measure height of flue tile extending out of chimney. If this measurement is less than 1.25 inches, you will need a flue extension. Top quality heavy gauge welded construction. These premium stainless steel caps are made of 100% type 304 stainless steel for lifetime protection against rust and corrosion. The galvanized cap is constructed of flat expanded galvanized metal screen and an 18 gauge frame, powder-coated with a protective, flat black finish to assure long lasting beauty. Lifetime warranty. These stainless models come with a lifetime warranty against rust and manufacturers defects. Galvanized models come with a 5 year warranty against rust through. We stock over 50 sizes to fit all clay flue tiles - square, rectangle, oval, and round. This saves you time and money. 5/8" expanded metal available. California or local code requirements may require 5/8" screen. Easily installed. Four or more screws secure cap to flue. 1/8" thick weld nuts are welded to the frame so screws do not strip out and go in straight. A screwdriver is all you need. Full 8" high. These caps are a full 8" in height. This minimizes flue restruction which may cause back smoking. Optional: Heavy Duty Leg Kit is available. For use when flue does not extend above crown.